We’d love your help. Let us know what’s wrong with this preview of A Pattern of Lies by Charles Todd. An explosion and fire at the Ashton Gunpowder Mill in Kent has killed over a hundred men. It’s called an appalling tragedy—until suspicion and rumor raise the specter of murder. While visiting the Ashton family, Bess Crawford finds herself caught up in a venomous show of hostility that doesn’t stop with Philip Ashton’s arrest. Indeed, someone is out for blood, and the hous An explosion and fire at the Ashton Gunpowder Mill in Kent has killed over a hundred men. It’s called an appalling tragedy—until suspicion and rumor raise the specter of murder. While visiting the Ashton family, Bess Crawford finds herself caught up in a venomous show of hostility that doesn’t stop with Philip Ashton’s arrest. Indeed, someone is out for blood, and the household is all but under siege. The only known witness to the tragedy is now at the Front in France. Bess is asked to find him. When she does, he refuses to tell her anything that will help the Ashtons. Realizing that he believes the tissue of lies that has nearly destroyed a family, Bess must convince him to tell her what really happened that terrible Sunday morning. But now someone else is also searching for this man. To ask other readers questions about A Pattern of Lies, please sign up. Any synopsis of the book yet? I LOVE the Bess Crawford series and can't wait to read this! Can this be read as a stand-alone book or do I need to read the Books 1-6 first? Sounds like a great book and series! I hoped I would like this book, I had no idea how much I would come to love it. It's not always easy to start a series with the latest book instead of with the first, but this one was easy to get into. Bess Crawford is a nurse during WW1 and she spends a lot of time in France tending to the wounded soldiers and that is how she got to know Mark Ashton. Now, later on, she runs into him again, this time in England where he is visiting his family before getting back to France. She learns that his fam I hoped I would like this book, I had no idea how much I would come to love it. It's not always easy to start a series with the latest book instead of with the first, but this one was easy to get into. Bess Crawford is a nurse during WW1 and she spends a lot of time in France tending to the wounded soldiers and that is how she got to know Mark Ashton. Now, later on, she runs into him again, this time in England where he is visiting his family before getting back to France. She learns that his family is having a troublesome time. Some time before the Ashton Gunpowder Mill in Kent exploded and killed over a hundred men and even though it was judged to be a tragedy are there a lot of rumors in the village that Mark's father Philip is behind the explosion. Someone is feeding the people in the village with wicked rumors and Bess witness herself how the people treat the Ashton. Who is behind the rumors and why is the person hell-bent on ruining the Ashton? It didn't take me long to get swept into the story in this book. Then again a well written historical fiction is something I always love to read, especially one with a mystery involved. Bess (Not Mary, for some reason I try to write Mary Crawford, but I think that's because she reminds me of Mary Russell from the Laurie R. King series) Crawford is not an amateur sleuth, she is a nurse, home on a leave and soon back to France and that is why she gets involved with Ashton case, partly because she saw how the Ashton was treated and her witness Philip Ashton getting arrested, but also because the only witness is in France fighting and she is the one that can try to get to him to get Philip Ashton free. But nothing is that easy and trusts me sometimes the book is really nerve-racking to read. One thing I truly enjoyed reading this book was that there was no romance between Mary Bess and any of the male characters. That was refreshing, sometimes I feel that romance takes up a too large role in books and it sometimes gets in the way of the story or it gets too cheesy. But I do admit that even though there is no romance have I started to ship her with Sergeant Lassiter, the wonderful Aussie she turns to in France for help to finding the witness. He is flirtatious and I have completely lost my heart to him (Just think Hugh Jackman in a WW1 uniform) and I hope to God if in the future Bess do find a sweetheart it will be him. I recommend this book warmly to anyone that wants to read a really good historical fiction; you can read this book without having read any book before. Once again Sister Bess Crawford, WWI nurse, investigates a mystery. This time, she's helping an army officer prove his father's innocence in a horrific gunpowder factory explosion. The Ashtons live in a small village near the coast in Kent, and Philip Ashton, mill owner, is arrested on suspicion of causing the explosion two years in the past which killed and injured a great many villagers. The town, including the police, is convinced that he is responsible, and his whole family is shunned and su Once again Sister Bess Crawford, WWI nurse, investigates a mystery. This time, she's helping an army officer prove his father's innocence in a horrific gunpowder factory explosion. The Ashtons live in a small village near the coast in Kent, and Philip Ashton, mill owner, is arrested on suspicion of causing the explosion two years in the past which killed and injured a great many villagers. The town, including the police, is convinced that he is responsible, and his whole family is shunned and subjected to harassment. Bess is equally convinced that he is innocent and she uses her status as a nursing sister at the front, and her Army contacts via her father, to help figure out what really happened. The title may be “pattern of lies” but the end result became a design for destruction. While this is a murder story, it is also, and more significantly, a story about the evil that men (and women) do, and man’s (and woman’s) inhumanity to their fellow humans. And that’s what makes this one so chilling. It’s not the original murder, it’s the mob mentality that takes over a small town and very nearly hounds an innocent man to his death. As we have found out all too often in modern times, the cover-up is often nastier and more costly than the original crime. This particular instance takes that truism to new heights. Or perhaps that should be depths. Something horrible happened in a small town in Kent. In 1916, the gunpowder mill exploded, killing over 100 men and putting a big dent in explosives production right after the Battle of the Somme. It was a heavy blow for the British Army to lose one of their best producing explosives factories, but it was an even bigger blow for Cranford, the small town that provided the workers for the mill. Not only did most families lose a breadwinner, but the mill’s production was moved elsewhere, and the town never recovered economically. Kent is near the Channel, so the Army conducted an investigation into the cause of the explosion and the fire that followed it. They determined that there had been no sabotage, by the Germans or anyone else, and that the tragedy was just a terrible accident. At the time, everyone seemed saddened but satisfied. Bess Crawford visits Cranford in 1918, two years after the tragedy, only to find that someone or something has revived all of the horror and all of the blame-seeking in this village. She visits one of her former patients, Mark Ashton, and his family. The Ashtons owned the mine, and suddenly, out of the blue, someone is conducting a malicious rumor campaign that places the blame for the explosion squarely on Mark’s father Philip’s shoulders. Philip Ashton is arrested for multiple murder while Bess is visiting. The question is, who started up all the horrible rumors? And why? Who benefits from not just putting Philip Ashton in jail, but also terrorizing his family and even trying to get his poor innocent dog put down? There is a campaign of terror being waged against the Ashton family, and by the point that Bess becomes involved, every single person in Cranford is involved, including the police. Everyone lost someone in that explosion, and everyone has decided to blame the Ashtons for their grief. Whether that blame is justified or not. Bess, with her dogged determination, follows the trail of heartless evil back and forth across the Channel, from the battlefields of France to the civilian warfare in Cranford. As more and more lies spring up in Cranford, more and more soldiers with even a tangential connection to the original tragedy turn up dead at the hands of their fellow British soldiers. It is up to Bess, with a little help from her father and her network of former patients in the Army to track down the horrible truth - before it is too late for both Philip Ashton and for Bess. Escape Rating A: I loved this book, but I don’t think it’s a good place to start the series. If you love historical mysteries or the World War I period, A Duty To The Dead would be a much better starting point. But I love Bess Crawford. So often in historical fiction, when there is a female protagonist the author needs to invent a reason for the heroine to be atypically involved in the wider world. With Bess, those reasons are built into the period and her character organically, and it works so well. Bess is a trained combat nurse during World War I. This provides a reason for her education and attitudes, while at the same time she acknowledges that there are still limits on her behavior and movements. While it seems strange to 21st century readers, Bess really does have to be concerned about the appropriateness of her behavior and appearance at all times, or she may lose her position in the nursing profession. She can be up to her elbows in blood and guts one day, and have to worry about whether the nursing service will think her accommodations unsatisfactory to the reputation of said service the next. She is also more open-minded than we think of for the period. Again, some of that is her training, back to the blood and guts. Her sometimes cynical view of human behavior is born out of her actual experience in the war. She knows how badly people of all ranks behave because she has to sew up the results on an all too frequent basis. Also, her experience of the world is broader than most women of her class because her father has been a serving officer in the British Army for decades, and her mother “followed the drum” going with him and taking Bess to far-flung postings in the British Empire. So when Bess sees something wrong, she looks for a way to right that wrong, whether it is a medical emergency or a miscarriage of justice. She doesn’t sweep things under the rug, because that’s where germs fester and grow. She brings things out into the light where they can be identified and if necessary, surgically removed. The story in Cranford is one that tugs at her because she can see how wrong it is, and how hard it is to fix. Also, from her outsider’s perspective it makes no sense. That there would have been suspicion at the time, yes, that’s both logical and human. But that the suspicion has not just resurfaced but become pervasive two years later? There must be a reason and Bess, as usual, is determined to find it no matter how much danger she throws herself into along the way. What sticks in the mind in this story is not the motive for the rumor campaign, but the way that everyone in the village jumps onto the bloody bandwagon. We see mob mentality at its worst, and it is both frightening and disgusting. But we know it is all too possible. The Bess Crawford Series is an enjoyable cozy mystery series set in England during WWI. Main character Bess Crawford is a nurse and a bit like Jessica Fletcher in Murder She Wrote (telling my age a bit with that comment). Bess is continually stumbling across murders and helping to solve them. In A Pattern of Lies, Bess helps solve a two year old crime in which a 100 factory workers were killed in an explosion. The explosion and its severity were based upon fact. There is a lot of detail provided The Bess Crawford Series is an enjoyable cozy mystery series set in England during WWI. Main character Bess Crawford is a nurse and a bit like Jessica Fletcher in Murder She Wrote (telling my age a bit with that comment). Bess is continually stumbling across murders and helping to solve them. In A Pattern of Lies, Bess helps solve a two year old crime in which a 100 factory workers were killed in an explosion. The explosion and its severity were based upon fact. There is a lot of detail provided to help paint the picture of environment. I have a difficult time believing a nurse would be given as much leave time as Bess is given in the series, but perhaps that is on target too. I especially enjoyed the return of Sergeant Lassiter in A Pattern of Lies. As always, Simon and Colonel Sahib are great contributors to the story line. I listened to the book on CD and it was well read. Even so, I would have appreciated a bit faster pace in the story itself. Sometimes I felt the descriptions of unrelated things bogged the story down, as well as repetitions of the plot to that point in the story. This has been a good series showing a side of WWI —dealing with the wounded as Sister Bess Crawford, a nurse near the battlefront often deals with more than medical issues. But with this seventh in the series, it seems to be like the war itself, never-ending. I agree with some others commenting that Bess doesn’t seem to have a personal life. There have been several opportunities for at least to have a boyfriend, if not a love affair. I checked and there are two remaining books in the series, and This has been a good series showing a side of WWI —dealing with the wounded as Sister Bess Crawford, a nurse near the battlefront often deals with more than medical issues. But with this seventh in the series, it seems to be like the war itself, never-ending. I agree with some others commenting that Bess doesn’t seem to have a personal life. There have been several opportunities for at least to have a boyfriend, if not a love affair. I checked and there are two remaining books in the series, and it’s not until number nine in the series does the war end. So I’m not sure I’ll read anymore of the series. I do, however recommend the series for a picture of WWI from a point of view different than the war itself. I'm a huge Charles Todd fan. I adore the writing, the setting, the smart mystery and of course Bess Crawford. This was a satisfactory installment but I need Bess to grow in her character. I understand wartime has alter lives, however, Bess is becoming predictable and boring, we know what to expect and, most importantly, what not to expect from her romantically and personally. Yes, we know of her family, her dedication to her job, a woman of principles but we really don't know her singularly from all that's been generically fed to the reader. With the war closing I hope Todd reveals more of Bess, her enigma status is starting to become rote. Simon, Lassiter or an onslaught of men - just bring someone into the mix so we can have some life breathed into this once captivating series and character now growing unbearably stale. Can't say I was thrilled with the ending, abrupt closing considering the apex was adrenaline fueled, loose ends left dangling. Prefer a tidier wrap-up. 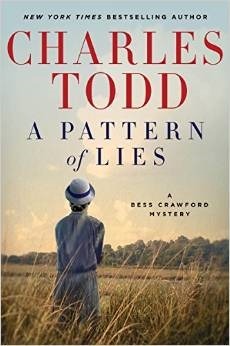 Regardless of the future of Bess Crawford, Charles Todd certainly delivers with stellar writing along with a sophisticated mystery. Looking forward to more evolvement (fingers crossed) in the series. For those who love the mother/son team of Charles Todd, their new book is wonderful. It's towards the end of WWI and Bess Crawford is still going back and forth from England to the battle zone in Europe. A terrible fire and explosion has destroyed an armament factory in Kent. The Army ruled it an accident after first looking for German saboteurs . Now 2 years later, rumors are circulating that Philip Ashton , the owner of the factory purposely destroyed it. The entire town is buying the rumor a For those who love the mother/son team of Charles Todd, their new book is wonderful. It's towards the end of WWI and Bess Crawford is still going back and forth from England to the battle zone in Europe. A terrible fire and explosion has destroyed an armament factory in Kent. The Army ruled it an accident after first looking for German saboteurs . Now 2 years later, rumors are circulating that Philip Ashton , the owner of the factory purposely destroyed it. The entire town is buying the rumor and the Ashtons have become ostracized but Bess , who is friends with the Ashtons can't believe it. And with the help of some well placed associates and relatives she is determined to get to the bottom of the story. I won this Book through Goodreads First-Reads. Thanks Goodreads. The setting is WWI in France and England. Nurse Bess Crawford is a very caring nurse that is always looking for the truth. After an Ammunitions Powder Mill blows up and kills many workers. The owner is in prison awaiting trial. She helps the authorities and military find the person responsible. I don't know what the draw if for mystery's and perhaps it is that we love to feel like we are contributing to solving the unknown. Set against the backdrop of WWI, as readers immerse themselves into the nursing duties of Bess Crawford. It is a time where nursing was just beginning to grow their grassroots and it wasn't a pretty way to get involved for women to help in the war effort. It is a time of unsanitary conditions, amid the begins of medical procedures while bombs and shells are going of I don't know what the draw if for mystery's and perhaps it is that we love to feel like we are contributing to solving the unknown. Set against the backdrop of WWI, as readers immerse themselves into the nursing duties of Bess Crawford. It is a time where nursing was just beginning to grow their grassroots and it wasn't a pretty way to get involved for women to help in the war effort. It is a time of unsanitary conditions, amid the begins of medical procedures while bombs and shells are going off all around. Where sleep and a good meal are the blessings one can hope for. An explosion at the Ashton Powder Mill in Kent has claimed the lives of a hundred men, and like everyone involved they want answers to what happened. As time presses on, this is written off as simply an accident from war efforts and soon it is swept under the rug. But rumors don't like to lie in the dark, and soon hints at murder rock the Ashton family and it seems the only one who can help provide the answers has been dispatched to the frontlines. Will Bess be able to help unravel the pattern of lies to help end the persecution of the Ashton family or will she become the next target of the killer at large? Quite possibly, my least favorite book in the series. Well, finally, in BOOK SEVEN we're given a physical description of Bess. Bess has light brown hair and dark eyes, not the auburn hair and green eyes I was forced to ascribe to her on my own initiative. I'll just have to adjust the mental picture I conjured up around book three since there was never a prior description of the MAIN CHARACTER. Shame on the Todds for such a glaring oversight. I think the family of Philip Ashton was pretty stupid n Quite possibly, my least favorite book in the series. I think the family of Philip Ashton was pretty stupid not to realize sooner than they did that a new lawyer was needed. The original law team was obviously entrenched with the other side and were making absolutely no efforts to defend Ashton. One annoying quirk in this book. Whenever Mark Ashton spoke about Philip Ashton to Mrs. Ashton, he always said "my father". Such as "...if she would be allowed to visit my father." Why would he talk in such a stiff, formal manner about his dad with his mom? Very awkward sounding. Wouldn't he just say "father" and leave off the possessive pronoun? This review has been hidden because it contains spoilers. To view it, click here. Another two-and-a-half star book - what's up with all these writers lately? A Pattern of Lies was going pretty well, with a plot line that was gripping. The war is winding down and everyone is on edge with anticipation and dread. Although Bess was her usual know-it-all self (not as obnoxious as the last book, thank goodness! ), there was such an impression of menace and foreboding in the events that it was hard to put down. Then came the ending, and THAT balloon got popped. After all the buildup Another two-and-a-half star book - what's up with all these writers lately? A Pattern of Lies was going pretty well, with a plot line that was gripping. The war is winding down and everyone is on edge with anticipation and dread. Although Bess was her usual know-it-all self (not as obnoxious as the last book, thank goodness! ), there was such an impression of menace and foreboding in the events that it was hard to put down. Then came the ending, and THAT balloon got popped. After all the buildup of so much tension, it was such a banal ending. I just finished this and need some time to think about what I want to say about it. It's been a few days and I hate to admit that I was disappointed with this book. The first books in this series were fabulous. Can't stop reading kind of fabulous. Bess was smart and likeable and interesting. The attraction between Bess and Simon was fun to read. This latest book, and frankly the one before it, is dull. There's no spark anywhere. I hope the Todds are able to capture the essence of the beginning of I just finished this and need some time to think about what I want to say about it. This latest book, and frankly the one before it, is dull. There's no spark anywhere. I hope the Todds are able to capture the essence of the beginning of the Bess series and bring it to their next book - which I will listen to as soon as it's available, by the way. In 1916, at the height of the war, an explosion and fire at Ashton Gunpowder Mill in Kent killed more than one hundred men. Army investigation of the tragedy attributed it, most probably, to German subversive activity. In 1918, a web of hometown lies and suspicion emerge and attempt to credit the disaster to the owner, Philip Ashton. Bess attempts to help former patient (Major Mark Aston) and his family when resurfacing accusations result in the arrest of the elder Ashton. The sense of time and place is precise, as I've come to expect of Charles and Caroline Todd. Rosalyn Landor , as narrator, excels as usual. Good story, but the character development of Bess is very thin. This review has been hidden because it contains spoilers. To view it, click here. I have really enjoyed past books in the Bess Crawford series, but this one not so much. Does Simon Brandon not have anything better to be doing besides following Bess all over France and England? Seventh in the Bess Crawford historical mystery series set during World War I with this story in the autumn of 1918 near the end of the war and revolving around Sister Crawford. The action takes place between the frontlines in France and around Canterbury in Kent. Todd had my heart rate going on this one. I could not see how they would ever be able to figure out what was going on. And what is with that police station?? Were they that unsupervised at the time? Were they that autonomous?? Su Seventh in the Bess Crawford historical mystery series set during World War I with this story in the autumn of 1918 near the end of the war and revolving around Sister Crawford. The action takes place between the frontlines in France and around Canterbury in Kent. Todd had my heart rate going on this one. I could not see how they would ever be able to figure out what was going on. And what is with that police station?? Were they that unsupervised at the time? Were they that autonomous?? Surely the Colonel Sahib had a bigger network he could have tapped to push someone of a higher rank in the police into taking a peek? At least he did have Simon to send off on those errands. Why would a powder mill foreman have matches at work? Why wasn't Bess trying to find out more about Collier? He had been one of the principals at the time, and she's certainly spent a lot of effort to find others involved. Then again, people were much more insular at that time, ignorant of people's rights, and it was too easy to toss justice aside. Throw in loved ones who were grieving or dead, and it's a recipe for disaster. That insularity certainly didn't help when it came to that bloody family lawyer. What were they thinking keeping him on for that long? What really ticked me off, though, was what it all came down to in the end. That was the best Todd could do? All that for just that?? It does take all kinds, but…oh, boy…that ending simply didn't ring true for me. The guy must have been bloody stupid, in which case, how did he ever get assigned that job? While the ending was annoying, I do generally adore Todd's stories. Not only does Todd provide a more direct look at war from a field hospital's perspective, but Todd is so true to the time period. The clothing, the manners, the expected mores, the style of life for both classes. It pulls me into the period. Then there's Bess, Simon, and the Colonel. I do adore them. They want the best for everyone and will do whatever it takes. They're honorable people…and surprisingly forward in their thinking in "allowing" Bess to pursue her interests. Considering how women were treated at the time, it's quite progressive. I'm with Philip Ashton in some respects. People must know something of the man, of his care for the people who work for him, the mill's past record, and they should all have weighed in on his side. Especially his friends!?! I could wish Todd would write a follow-up some time in an upcoming story to reveal what happens later on. It's all so insidious. Hateful. What's worse is everyone around the Ashtons is lying. It's the cops' behavior, their attitudes, that explain why people don't trust them. It's that attitude that makes me adore cops like Eve Dallas and Lucas Davenport. There's an interesting paragraph in which Bess thinks of all the innovations that have come to the battlefield with this war. It was a War to End All Wars in so many ways technologically, socially, economically, psychologically, and mortally. Oh, lord, Lassiter gets in trouble with his commanding officer, and it sounds so like him, lol! I do love his character. "He told his commanding officer that three men just reduced in rank for insubordination were actually trying to keep Captain Maxwell from looking like a fool. And he added that it had been all but an impossible task from the start." It's weird how Britton keeps changing rank from private to corporal and back again. And the Allies are thrilled that the Americans have come to help. A two-year-old tragedy is still stirring emotions in Cranbourne, the home of the former Ashton Gunpowder Mill. The explosion and fire were ruled an accident until suspicion and rumor begins to swirl around the village. It's pure chance that finds Bess Crawford visiting the Ashton family and experiencing the venomous show of hostility that is aimed at anyone associated with the Ashtons. The persecution vented upon the Ashtons raises Bess' ire, and she'll risk her own life to find the truth. Sister Bess Crawford is a nurse with Queen Alexandra's Imperial Military Nursing Service who works at various field hospitals on the frontlines in France. Her father, Colonel "Sahib" Crawford, may be retired, but he's hip-deep in the background along with his former batman, Sergeant-Major Simon Brandon. Her mother works tirelessly on the homefront with her charities and being a comfort to the wives and families left behind. Melinda Crawford is a cousin who lives in Kent. Mrs. Hennessey is Bess' London landlady. Mary and Diana are her flatmates. Captain, or rather, Major Mark Ashton was once one of Sister Crawford's wounded. Eloise had been the major's fiancée. Mrs. Helen Ashton is his very brave and determined mother. Mr. Philip Ashton is the very reserved father. Nan is Mr. Ashton's liver-and-white spaniel. Clara is the cousin in love with Mark. Their family home, an old abbey guesthouse, is in Cranbourne near the family's powder mill that blew up, killing over a hundred. Mrs. Byers is the housekeeper. Baxter seems to be a groundskeeper? Mrs. Lacey is the cook. Betty Perkins was one of the maids they had to let go. Mr. Groves is the ineffective family solicitor. Lucius Worley is a barrister. Florence Benning is the new witness who suddenly came forward after two years; her sister is George Tate's widow. Doctor Scott tried hard to treat Mr. Ashton but the police wouldn't allow it. Theodore Heatherton-Scott and his valet, Henry, arrive. He had a son, Lieutenant Scott, who had served under Colonel Crawford in India. Lieutenant Wilmont, Captain Hunt, and Sergeant "Granddad" Edgar have all written the major with news of his unit. Constable Hood could care less what happens to the Ashtons. Captain Collier had been the government's man overseeing work at the mill. Alex Craig had been a boatbuilder before the war and a pilot during the war until he was wounded and invalided out. Seems he was also interested in Eloise. Sergeant Rollins was a fisherman at the time; now he's a highly valued tank commander. Agatha Rollins is his despised sister with whom he has to share the family cottage. Mrs. Branch claims Nan killed three of her chickens. On the afternoon Bess had Nan on a leash while she was visiting Betty and Agatha. The ineffective Mr. Gardener is the vicar at the Church of St. Anne. Inspector Brothers lost some people in the explosion and isn't interested in justice. Mr. Parry is a vicar and witness whom Brothers is doubting along with others. Sergeant Lassiter is a very resourceful Australian who's taken a liking to Bess and can accomplish anything. Captain Maxwell is a young, green commander. Corporal Eustace never did send the papers in on the incident. Soldiers who have helped Bess include Sergeant Wills, Corporal Denton, Lieutenant Jamison, Lieutenant Harcourt, and Corporal Miller. Sergeant Hull was the recruiting officer in Devon. Major Atkins will take statements. The wounded include Lieutenant Harriman, Sergeant Overton is a tankman, Corporal Haines survived while his crew didn't, and Private/Corporal Charley Britton was in for trench foot and went sleepwalking. Lieutenant Henley visited Britton in hospital. Captain Thomas is running a fever while Captain Taylor died. Bess is toing and froing to England and back and always posted somewhere new. The people she works with include Sisters Herries, Hancock, Morris whom someone tries to suffocate, Anderson, and Cameron while the doctors mentioned are Lytton and Browning. The cover is a golden afternoon in a wide open field, a line of trees running diagonally at the back. It's Bess in a pale gray cloche with an almost black ribband atop her done-up hair and a bloused deeper, gray dress with the smocking at collar and shoulders gathering the fabric in thin vertical gathers. It's a thoughtful pose, as Bess looks out over the fields, her arms crossed in front of her. Review: It is the fall of 1918 and we all know the War to End all Wars will soon be over but nursing sister Bess and everyone else doesn't realize that. Bess is home from France on a short leave and is stranded at the train station with no train to catch to London to visit her family. All the trains have been commandeered for troops. So she decides to see some of the sights and runs into a former patient she nursed 2 years ago and he invites her to his home with his parents. Technically DNF. I got halfway and was bored to tears. So I skipped to the last chapter just to find out who did it. I used to love the Bess Crawford novels, but I think the formula is boring now. She doesn't strike me as a clever investigator (ala Hercule Poirot) as much as a busybody who stumbles onto the solution to the mystery. Also, the other characters are stereotyped. Sadly, this is probably the last Charles Todd novel for me since I felt the same way about the Ian Rutledge novels after th Technically DNF. I got halfway and was bored to tears. So I skipped to the last chapter just to find out who did it. As World War I is winding down, nursing sister Bess Crawford escorts a load of wounded to Kent. Next by is a former munitions factory that exploded killing a hundred men. Now the owner of the plant is arrested for murder and the family is being harassed. Bess investigates because she knows the faimily through the son when she was his nurse in France. I enjoyed this book, but thought it dragged a little in the middle. I still really enjoy the characters. I can never seem to rush through one of these books, but the slow savoring of each is satisfying. First Sentence: I didn’t know much about the little town of Cranbourne on the Swale in northwestern Kent, only that its abbey had been destroyed by a very angry Henry VIII when the abbot of the day refused to take the King’s side in certain matters. On leave from France and trying to get to her parents home, field nurse Bess Crawford runs into a former patient, Mark Ashton. Due to a train delay, Bess, is pleased to visit his family. On the way, Bess learns about mill tragedy that killed over a hu First Sentence: I didn’t know much about the little town of Cranbourne on the Swale in northwestern Kent, only that its abbey had been destroyed by a very angry Henry VIII when the abbot of the day refused to take the King’s side in certain matters. On leave from France and trying to get to her parents home, field nurse Bess Crawford runs into a former patient, Mark Ashton. Due to a train delay, Bess, is pleased to visit his family. On the way, Bess learns about mill tragedy that killed over a hundred men, and a town that blames Mark’s father who is arrested while Bess is there. Being unable to travel on, Bess stays to comfort Mark’s family and do whatever she can to unravel the lies and learn the truth. Bess Crawford is a very interesting character. She comes from wealth and position, which means she is well connected. Yes as true of many young women of her time in similar positions, she also answered the need of her country and is a WWI field hospital nurse, serving in France and often transporting seriously-wounded soldiers back to England. Because of this, she is independent, intelligent and self-reliant. As the daughter of a military man who served in India, she has learned to adapt to all types of people and situations. Not only is Bess appealing, but there is Sgt. Major Simon Brandon, who originally served as her father’s batman and now serves in intelligence, and someone with whom one would like to see a relationship develop with Bess. Additionally, there is Sgt. Lassiter, the Aussie with the kookaburra greeting call and indomitable spirit. It is interesting how easily one can imagine the Aussie accent in his voice, just form the dialogue. While the mysteries always tie into the war, they also stand on their own. Todd ensures you sense the emotional banishment of the family involved by the townspeople. They also provide an excellent example of the way in which rumors start and grow, eventually being thought to be the truth. And yet…”…its Man who caused such pain and loss. You can rage at man.” The clues are well established with some good suspense that even puts Bess in danger. “A Pattern of Lies” is a well-done, traditional mystery with strong characters, a very good plot twist and a dramatic conclusion effectively set against the backdrop of life during WWI. 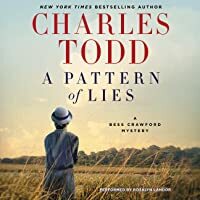 Charles Todd returns with the latest (#7) in the Bess Crawford series - A Pattern of Lies. Bess is a Sister with England's Queen Alexandra's Imperial Military Nursing Service. She has served her country since the beginning of the war in both France and England. It's 1918 and the hope is that the War will soon be over. A chance encounter on a leave plunges Bess into another mystery. (For in addition to being a stellar nurse, she's just as adept at solving mysteries) Mark Ashton, an officer and form Charles Todd returns with the latest (#7) in the Bess Crawford series - A Pattern of Lies. A chance encounter on a leave plunges Bess into another mystery. (For in addition to being a stellar nurse, she's just as adept at solving mysteries) Mark Ashton, an officer and former patient invites Bess to his family home to visit with his mother. The family owns the Ashton Powder Mill in Kent - the scene of a horrific tragedy that killed over a hundred men. Ruled an accident by the Army, the villagers think differently. Bess is stunned by the hostility shown to the family. As the rancor - and the danger - rises, Bess agrees to see if she can help. There's a possible witness to the event that can clear patriarch Phillip Ashton's name - he's a tankman in France. Oh, I just love this series! I think it's the slow, meticulous building of clues, the measured connecting together of pieces of information, observations and snippets of conversation. It's such a change from my usual fast paced murder and mayhem mysteries. The thoughtful, careful pacing of the book lets the reader settle in to relax, enjoy and travel back in time. Todd does a fantastic job of bringing the war and the time period to life. Descriptions of time and place generate vivid mental images. I really enjoy the glimpses into the war nurses' everyday lives. A sense of honour, duty, and loyalty is infused in the character and the plot, again underscoring the time period. Two years ago, the Ashton family gunpowder factory exploded, causing the deaths of one hundred workers. No one knows what happened. Now, suddenly, the Ashton family is the target of an intense whispering campaign implicating Mark’s father, Philip, in the explosion. When Philip is jailed and likely to hang for murder, Bess not only hunts for the man who purportedly witnessed the horrible explosion, but also questions the Cranbourne villagers who, in their anger, are united in the effort to see Philip suffer for the deaths of their loved ones. Charles Todd is the pen name used by the mother-and-son writing team, Caroline Todd and Charles Todd. Together they write the Ian Rutledge and Bess Crawford Series. They have published two standalone mystery novels and many short stories.